The dentists at Feather Touch Dental Care offer subtle, yet transformative gum contouring to improve the aesthetics of your smile. 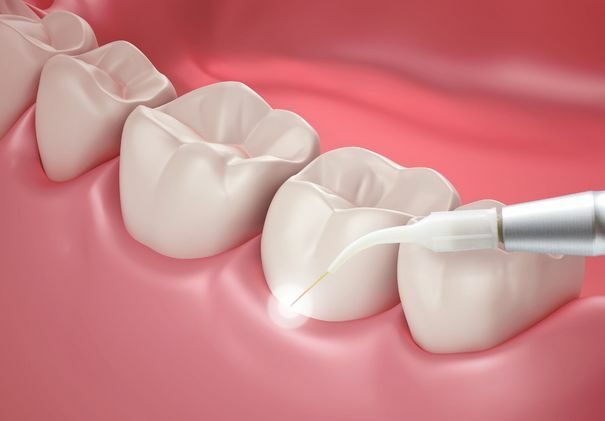 During the procedure, your doctor will sculpt your gum line by precisely removing excess tissue. If your smile appears gummy, or your teeth seem small or unusually shaped, Dr. Donald Ross, Dr. David Kim and Dr. Neal Shah may recommend gum contouring at our Atlanta, GA, practice. Also known as a gum lift, the doctors can complete the procedure in just one office visit, and you can leave our office with a beautiful, symmetrical smile. Occasionally, we meet patients who have perfectly straight teeth, but they still appear to have a crooked smile. The patient may have an uneven gum line, or the gums may extend too far down the teeth. This can cause the patient’s smile to appear unsymmetrical or disproportionate. Patients may also feel that their teeth look too small or irregularly shaped, which can result from overgrown gum tissue. When you arrive at our office for a gum lift, the doctor will begin by applying local anesthesia to numb your soft tissue. Using a diode laser, the doctor will gently trim excess gum tissue, sculpting your gum line to appear more uniform and symmetrical. Using a laser allows the doctor to complete the procedure with precision, and promotes quicker healing than traditional contouring methods. The heat from the laser will cauterize the tissue during sculpting, minimizing bleeding and reducing the chance of infection. Using a laser allows the doctor to complete contouring with precision, and promotes quicker healing than traditional methods. Most patients experience some swelling for about a week, but only minimal discomfort. The doctors recommend using an over-the-counter pain reliever, such as ibuprofen, to alleviate any discomfort. During the healing period, we recommend eating soft foods and brushing and flossing very gently. Gum contouring has many benefits. Patients who formerly worried about the excessive gumminess of their smiles will leave our office with a more symmetrical grin. The removal of excess gum tissue also helps lengthen the appearance of each tooth and restores symmetry to teeth that appear unusually shaped. The gum lift procedure provides patients with several health benefits as well. Removing excess tissue can help reduce pockets in the gums where harmful bacteria can accumulate. Gingivitis and the more advanced form of gum disease, periodontitis, can increase your risk of serious health problems like diabetes, stroke, and heart disease. Reshaping the gums provides patients with mental and emotional benefits as well. A more balanced, attractive-looking smile can boost the patient’s self-esteem and increase his or her willingness to smile and be social. Smiling more makes patients feel happy, and makes them seem more approachable to others. You can learn more about how your smile can benefit from a gum lift procedure during a consultation. To schedule an appointment with one of our doctors, contact our office today.